Love or loathe it, Damnoen Saduak Floating Market will always be a traditional and fundamental part of Bangkok life. The market is situated 100 kilometres (60 miles) west of the capital in Ratchaburi Province on a canal, or a Khlong as it's called in Thai. This immensely popular floating market is a combination of vibrant colour and absolute commotion. Some tourists love the energetic vibe while others feel it's a bit of a tourist rip-off. It may well be a little bit of both, depending on your point of view. But then again this will only become apparent should you decide to step out of your comfort zone and head on down here. I will explain all this in due course. Firstly, let me tell you that this illustrious market is named after a canal that was specially dug out to connect the Tacheen River with the Mae Klong River. It then continues to run right through the centre of town and the neighbouring region. Ample fruits and vegetables are grown in the exceptional soil quality found beside the canal. Cabbages, beans, onions, oranges, grapefruit, mangoes, bananas, papayas, coconuts and the Malacca grape are just some of the many varieties of produce that can be both enjoyed and purchased here. For this very reason alone, the floating market should certainly not be missed. It's near impossible to go to Bangkok without visiting one of the most famous floating markets in the world. And while there are many similar markets close to the city here, the most popular and easily the largest one is known as Damnoen Saduak. It's about an hour and a half by road from Bangkok. The place is a hive of activity with vendors and their tiny boats laden with all sorts of goodies such as tropical fruits, flowers and other fresh produce. It's also a kaleidoscope of vibrant colour that should have you reaching for your camera to captured some amazing moments. Bear in mind that it is a little on the touristy side but what the heck, it's well worth the crowded atmosphere. Apart from the open-air market alongside the canal trying to sell you stuff you don't need or want I really enjoyed the experience and the ambience. If you are adventurous like me, you can explore the nearby canals or klongs as the Thai's call them, in a long-tail boat to gain an appreciation of just how the locals live. The real attraction for tourists is a long boat ride along the canals where you will pass orchards, traditional Thai teak houses and places where locals do business. Enter their world and observe how the inhabitants live, work and play here. Tour companies cover these agendas in their itinerary and some even include a visit to Nakorn Pathom which is the site of Thailand's tallest Chedi called Phra Pathom. Apparently, this is the largest pagoda of its kind anywhere in Southeast Asia. 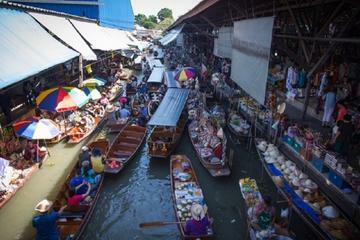 A trip to the Damnoen Saduak floating market is well worth the visit. The market itself can only be described as a chaotic collection of canals crammed with small flat boats steeped with freshly picked produce. Many boats are paddled by ladies bearing a variety of goodies, including much-needed hats and fans. Traders here scramble around to compete for the best position to grab a sale. The market is intensely diversified, eventful, lively, noisy, great fun and definitely entertaining. While the market might appear to be a picture perfect utopia according to the brochures found in most hotels and ticket stalls, it may also come with a few disappointments. You might only experience this once you arrive, but you need to go anyway. Not everyone comes away elated. I did say that it can get extremely crowded and noisy at times, but the real irritations are the constant harassment by touts who persistently flog their boat rides on the canal at exorbitant costs. Although the boat ride is a great idea, it can become rather tedious after a while. Another letdown is the huge covered shopping area alongside the main pier where vendors sell all sorts of... Can I say it... Absolute rubbish. Well, all sorts of mostly bland handicrafts that is. Don't waste your time buying anything here as prices are generally three or four times what you would normally pay at other markets around the city. In other words... It certainly pays to shop around. Don't waste your time bargaining either. You might just get annoyed and end up angry. There is nothing worth buying here. Rather go and purchase the fresh fruit sold by the boat people. If you do decide to go, go for the experience and not to shop. I thoroughly enjoyed the experience and the great vibe. But then I do love most things about Thailand. I hope this greatly helps you in your decision making. 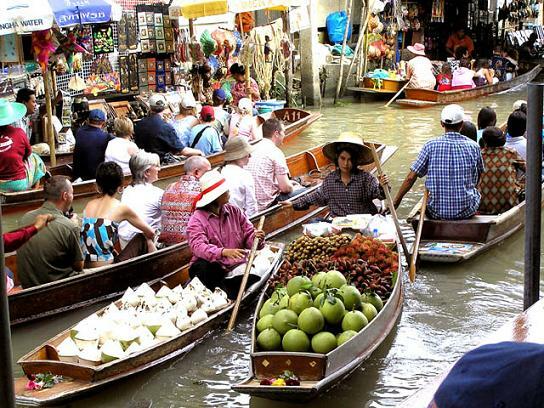 First and foremost, you need to get an early start should you be commuting from Bangkok because Damnoen Saduak Floating Market closes comparatively early at around noon or just thereafter. The trip by road will take approximately two hours but often takes a little longer due to frequent delays caused by heavy traffic and the ever-present constant construction along the route. Although you may have to get up a little earlier than you would normally, taking a Tour from Bangkok would be more than justified as the journey along the way is both pleasant and relaxing. All tours begin at sunrise so don't be surprised if your tour company collects you at your hotel around six in the morning. You may wish to travel by car yourself. To do this, take Highway 4 from Bangkok on the Phetchakasem Road for approximately 80 kilometres (48 miles) then turn left along Bangpae-Damnoen Saduak Road for a further 20 kilometres (12 miles). You could travel the night before and sleep over at a hotel in the area. Another possible option is to use the public bus service that leaves from the new Southern Bus Terminal at Phutthamonthon Soi 1 in the Taling Chan District. If you're unfamiliar with public transport in Bangkok, the easiest solution is to take a taxi to the terminal. Only, make sure the driver knows exactly where the new terminal is and doesn't take you to the old one, which has since stopped functioning. Although the new terminal is located along the same route, it's a little further on. About 10 kilometres from the Khao San Road area, 15 kilometres from Siam Square or Silom and a little bit more from Sukhumvit. Just remember it's always advisable to use metered taxis. The new terminal building has a similar appearance to that of a modern airport and best of all, there is air-conditioning. All the departure monitors are electronic with schedules in both English and Thai. Tickets to the market can be purchased at a numbered counter for your particular destination. Prices are reasonable and the buses are well-regulated and safe. If need be, you can draw cash from one of the banks as well as grab a bite to eat at the KFC outlet before you depart. If you have any questions or suggestions regarding Damnoen Saduak on this page that you'd like to ask or inform me about, please don't hesitate to contact me. I'll do my best to answer any questions or queries you have.